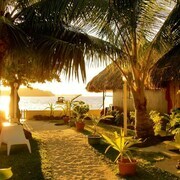 Nestled on the beach, this Bora Bora hotel is just steps from Motu Piti and Matira Beach. Matira Point is 0.3 mi (0.5 km) away. Where to find Bora Bora hotels near an airport? Where can I find hotels in Bora Bora that are near tourist attractions? Lush lagoons, rare barrier reefs, and breathtaking beaches make Bora Bora an enchanting spot to spend your next holiday. Situated in French Polynesia, this island’s exotic allure captures the hearts of visitors from every continent. 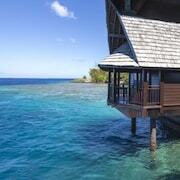 In this slice of hypnotic heaven, resorts and stilted bungalows stand overlooking turquoise waters. Succulent bananas, pineapples, melons, and coconuts dangle temptingly from lush trees as giant sea turtles and friendly dolphins call to you from the waves. If you want to plan a memorable trip to beautiful Bora Bora, let Expedia give you some pointers. Aside from supplying savvy travel tips, we can share amazing deals to help you book a cheap reservation at a dreamy Bora Bora hotel. Once you’re all checked in to your hotel, it’s time to explore. Put your adventure cap on and see what the city has to offer! From good eats to thrilling excursions, there are tons of things to do in Bora Bora, and you can book them all right here on Expedia. Bora Bora is famous for its hospitality. Resorts, retail stores, and restaurants focus on providing total comfort and satisfaction to travellers. 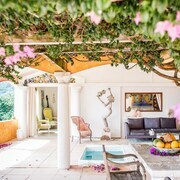 The island is one of the world’s top destinations for weddings and honeymoons. Relaxation is the primary objective of all who travel here, with lazy days of lounging, swimming, and snorkeling filling most itineraries. Things heat up in the evenings when pig roasts and dance parties take place. Seasons may come and go in Bora Bora without anybody blinking an eye because the months here have very little variation in temperature. You can expect to enjoy temperatures between 21 degrees Celsius and 31 degrees Celsius during your stay. The warm and soothing waters of the Pacific Ocean create the perfect opportunity to enjoy a holiday whenever the mood strikes you. A mix of adventure and relaxation is the perfect way to go on your Bora Bora vacation. Get ready to encounter an endless array of colourful fish when you snorkel at Coral Gardens or take a safari ride to Mount Otemanu to explore an extinct ancient volcano. Of course, nobody will blame you if you choose to stretch out on a beach blanket near your Bora Bora hotel for your entire holiday. However, you'll want to save a little room on that blanket for all the travel discounts Expedia can share with you. Do you want to save more and more in Bora Bora? 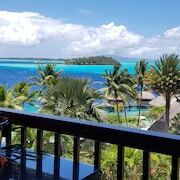 Let us show you how to combine flights to Bora Bora with stays at luxurious resort hotels. Our travel experts are standing by to answer any questions you have about planning a romantic or adventurous vacation to this wonderfully decadent island. Since tickets to Bora Bora are such a hot commodity throughout the year, book your vacation plans before that great resort you’ve been dreaming of fills up with other fast-acting travellers. What are the most popular Bora Bora hotels? Are there hotels in other cities near Bora Bora? What other types of accommodations are available in Bora Bora? Explore Bora Bora with Expedia.ca’s Travel Guides to find the best flights, cars, holiday packages and more!